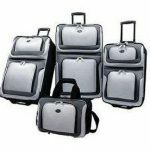 The Samsonite Omni PC3 Piece Set is considered as a durable and mid-range option.  It is great for business and vacation travel. This lightweight line offers heavyweight protection riding on 360 Spinner Wheels. Don’t pull your case: let Omni PC roll comfortably beside you on your journey. It has a modern yet professional design along with pleasing bright color options to choose from. 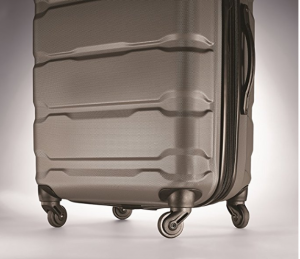 Samsonite Omni comes with this “micro-diamond” texture, making it remarkably scratch-resistant. 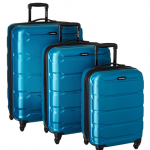 With its expandable features, this luggage set is great for long trips. 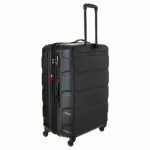 The 4 multi-directional wheels in Samsonite Omni do an exceptional job by providing a steady roll, and the bag sustains its balance well. The retractable handle is durable and works well when we hold it from the side and top. 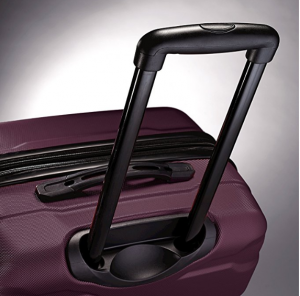 The Omni is secured with a TSA approved lock, in case you want to lock your luggage. 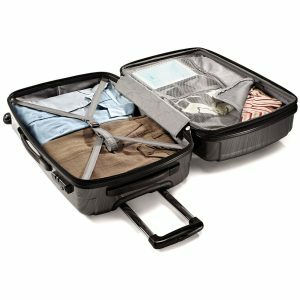 Coming to the interiors, the Samsonite Omni luggage has a standard and a manageable interior with clip-tie, mesh pocket, and a zipper to span the length of the bag. Design includes expansion for added capacity when needed. Considering it is 100% PC and comes with a TSA lock, the price tag is excellent for a name brand. 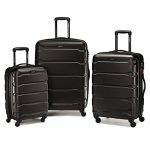 The Samsonite Omni Luggage Set ships at 30.5 pounds. This is far from the lightest in the industry, but it is on the lighter side. 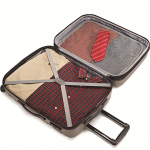 Samsonite is known for strong and durable luggage. The Samsonite Omni Luggage Set seems to stay true to that image. The Samsonite Omni is a stylish luggage set with features that ultimately match its price (when it is on sale – which is 99.9% of the time!). 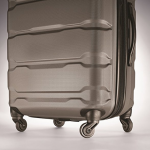 With the micro-diamond textured base, the suitcase looks great. The wheels roll smoothly along with a TSA lock for security. 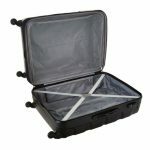 But, if you are looking for lots of pockets and compartments, you may not find the Samsonite Omni up to par. All features are beyond expectations! 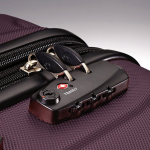 The Samsonite Omni is targeting the mid-grade luggage market. For a mid-grade market, all these features are beyond expectations. Easy control with 360 degree rotating wheels. It is a bit pricey, if not available on sale.